Back when I was in my formative years as an anime fan in the early 2000s and wanted to get out to watch anything animated coming out of Japan, it wasn’t easy to catch anime in theaters. The Hawaii International Film Festival had a few, and on occasion one or two might have shown up at the Varsity or Wallace’s Restaurant Row art house complex (anyone remember when those were actual things?) (of course you do; I mean, wow, some of you reading this are old enough to remember the older Japanese theaters, which is way cool), but those were few and far between. The month we’re entering now shows just how much things have changed. This month brings word of three anime features screening in local theaters this month, including — whoa! — the first time I can recall in a long time, if ever, that several Hawaii island theaters are included in a limited-run anime screening. The film that’s getting this relatively widespread distribution is Dragon Ball Z: Battle of Gods, otherwise known as “that Dragon Ball Z movie for which they were carrying around the poster everywhere Ryo Horikawa, the Japanese voice of Vegeta, appeared during Kawaii Kon 2013.” Here he is with panelists Lisle Wilkerson and Pali Kaaihue … and that poster. One of the gods of Battle of Gods is Beerus, the God of Destruction who has the power to make everyone drunk and post incriminating selfies of themselves on various social media outlets. (A portion of that last sentence may be more what I imagine a character described as “Beerus, the God of Destruction” to be and not reflect reality.) Beerus is on his way to Earth, which means it’s up to you-know-who to input his “God mode” cheat code and face him. … no, of course it’s Goku. Much screaming and KAMEHAMEHA~!-ing and sock-biff-powing and explosions will likely ensue, and … well, you probably know what you’re in for with a Dragon Ball Z-series movie, so you’re either already eager to check it out or moved ahead to look at the details of the My Neighbor Totoro screenings a bit further down. So when can you see Battle of Gods? The first big day is Tuesday, when four theaters — Consolidated’s Ward Stadium 16 complex on Oahu and the Kaahumanu 6 complex in Kahului, and Regal’s Makalapua Stadium 10 complex in Kona and Prince Kuhio 9 complex in Hilo — will be showing it at 7 p.m. The Kona and Hilo theaters will also have screenings at 7 p.m. Wednesday. Tickets for those screens are available on Fandango. Tickets — at $10 general, $8 museum members — are available at www.honolulumuseum.org/events/films/14523-dragon_ball_z_battle_gods. Around the middle of this month, Consolidated’s Kahala 8 theaters will host screenings of My Neighbor Totoro as part of the ongoing “GKIDS: Animated World” series of animated features “for kids of all ages” … which I just learned about while writing this post Thursday night, so I’m a bit sad about missing features like The Secret of Kells, A Cat in Paris and Tales of the Night. 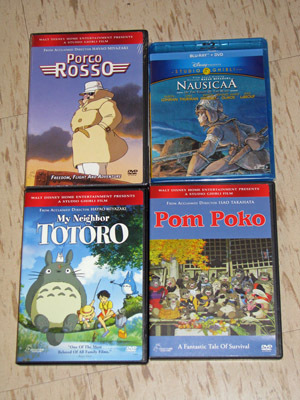 Totoro will screen Sat. Aug. 16, at 11 a.m., Mon., Aug. 18, at 3:30 p.m. and Tues., Aug. 19, at 11:30 a.m.; presale tickets are available now on Fandango. Get Pop-Cultured at Barnes & Noble: Another weekend, another set of artist appearances and Kawaii Kon-hosted activities at the Ala Moana store. The fun kicks off Saturday at 1 p.m. with appearances by MidWeek cartoonist/Cacy & Kiara and the Curse of the Ki’i author Roy Chang and artist Theo Lee (one of the featured artists in our Sakai Project profile (subscription required to read) on Sunday!). That will be followed by cosplayers dressed as Marvel Comics characters at 2 p.m.; Kawaii Kon’s “Iron Cosplay” costuming-on-the-fly event at 3 p.m.; and Comic Jam Hawaii’s Marvel sketch session at 5 p.m., where artists will draw various characters and the pieces will be raffled off to lucky patrons at the end of the hour. Remember that Kids Inc. Business Showcase I wrote about in my last post, where I highlighted Joelle Lee and her “Joelle’s Custom Artwork” booth? 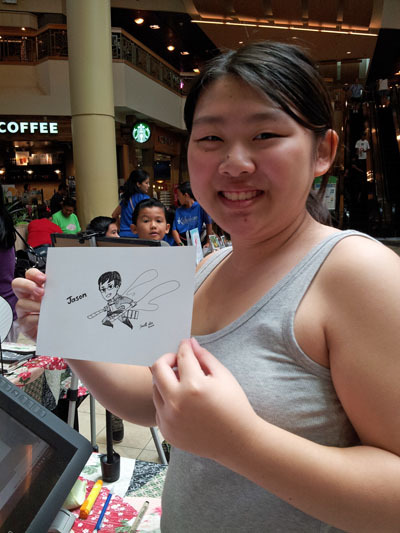 I swung by Windward Mall and commissioned her to draw a caricature of me, and boy, did she ever deliver. I happened to be wearing a chibi Attack on Titan shirt at the time, so she drew me as one of that series’ soldiers. And here’s Joelle herself with the finished product. I liked the drawing so much, I’ve been gradually uploading it as my new avatar on pretty much all the social media networks I’ve been frequenting. (Except Instagram. I kinda like that “me with Doraemon plushie” look.) I would highly recommend getting something from her if she sets up another booth sometime in the future … I’ll definitely try to keep tabs on when/if she makes another appearance. About a month and a half ago — Sept. 7, to be exact — a bunch of artists gathered on the Civic Center grounds during the First Responders Fair to paint art boards for Fire Prevention Month, using the theme of “Prevent Kitchen Fires.” One of those artist groups was MangaBento, the anime- and manga-inspired young artist group featured regularly in this space. 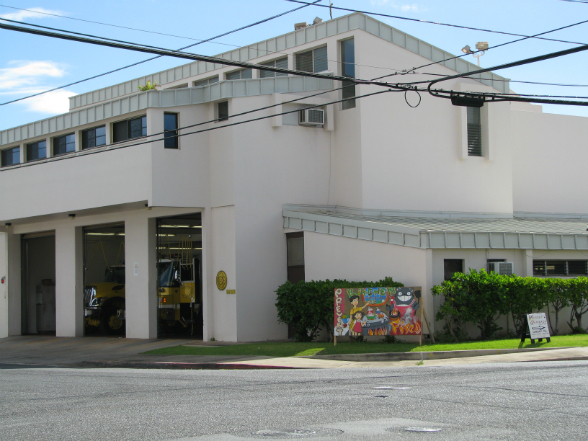 Those boards have been up at Oahu’s fire stations this month. Probably will be up for a few more days, at that. And where did MangaBento’s board end up? 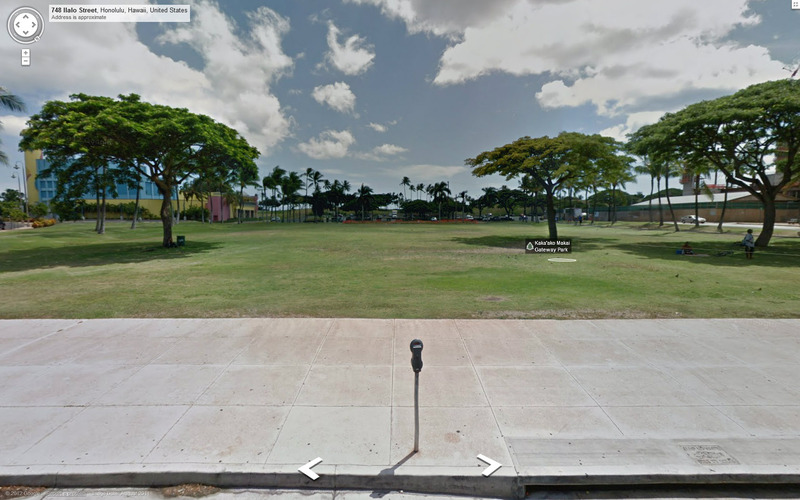 At the corner of Leoole and Leonui streets in Waipahu, sitting near what’s formally known as Honolulu Fire Department Station 12, you’ll find … this. And here’s the board close up. 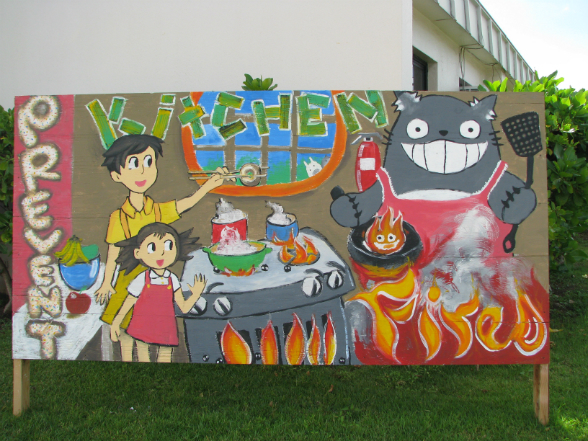 The Totoro cast plus Howl’s Moving Castle‘s Calcifer, advocating fire prevention? Yeah, that’s a message I can get behind.